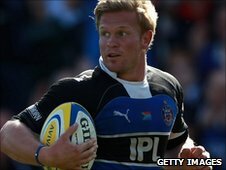 Bath climbed above Harlequins into the top half of the Premiership table with a tightly fought victory. Michael Claassens scored an 11th-minute try to give the home side the lead but Nick Evans responded with two kicks. Butch James' kick extended Bath's lead, before a third penalty from Evans closed the gap to a point at half-time. Evans and James traded two penalties to keep the deficit at just a point, while the latter's fourth successful kick gave Bath a four-point victory. Bath move up to sixth in the table, nine points behind fourth-placed Northampton. The opening score went the home side's way as Nick Abendanon made ground down the left and found Claassens to finish off the move, while James put over the extras. After Bath were caught offside under their own posts, Evans kicked his first penalty on 18 minutes and then his second eight minutes later. A 40-metre kick from James saw Bath take control again but their half-time lead was only 10-9 as Evans kicked over in the 34th minute. Penalties dominated the second half as James slotted two from long range to open up a seven-point lead, but still Harlequins stayed in touch with Evans' fourth penalty on 52 minutes. After Sam Vesty was shown a yellow card for killing the ruck ball, Evans kicked successfully to make it a one-point game again. James kept his nerve for another long-range kick on 63 minutes to stretch Bath's lead and, despite a frantic finish, Bath held on for a four-point victory. "It was always going to be a tense affair with the two sides so closely matched but what you can't fault at all is the desire of our guys. "That second 40 was monumental. We were disappointed with the first 40 but happy to get in at half-time and not to have conceded (a try). "They targeted us at the ruck and got a bit of change out of that but we spoke at half-time and tightened things up a little bit. After that, our first-up hits were a lot more accurate." "We didn't play as we could. Everyone is very disappointed. "For the first 20-25 minutes of the second half, we were average beyond belief. That wasn't a performance level that anyone can be happy with. "We needed to score a try today and we didn't. We want to be a good side to win, not to watch." Bath: Vesty; Banahan, Carraro, Hape, Abendanon; James, Claassens; Flatman, Mears, Wilson; Short, Grewcock; Hooper, Mercer, Skirving. Replacements: Dixon, Catt, Bell, Fernandez Lobbe, Ovens, McMillan, Biggs, Scott. Harlequins: Brown; Camacho, Lowe, Turner-Hall, Monye; Evans, Care; Jones, Gray, Andress; Kohn, Robson; Fa'asavalu, Robshaw (capt), Easter. Replacements: Cairns, Lambert, Johnston, Vallejos, Skinner, Moore, Clegg, Chisholm.